At first everything went as planned: the vehicle separated from a B-52 Stratofortress high above a naval air warfare center sea range in California and decoupled from the rocket booster. But 31 seconds into the test, a problem developed with a cruiser control fin and the X-51A Waverider hypersonic vehicle plummeted into the Pacific Ocean, missing its target of cruising at Mach 6 for five minutes. Despite the August 14 failure, the race for hypersonic cruise vehicle (HCV) capability between the US, China, and Russia is still on, with India piggybacking on Russian efforts. For a number of years now, the three countries have made major advances in the development of air vehicles that can be maneuvered at speeds beyond Mach 5 (6,125kph). While interest arose during the Cold War, real advances only occurred in the early 1990s, with Russia becoming the first country to successfully test-flight a supersonic combustion ramjet, or scramjet, experimental vehicle, beating the U.S. by nine years. The X-51A is the result of a consortium involving the USAF, Boeing, the Defense Advanced Research Projects Agency (DARPA), the National Aeronautic and Space Administration, Pratt & Whitney Rocketdyne, and the USAF Research Laboratory’s Propulsion Directorate. So far, the US$140 million program’s only success occurred on May 26, 2010, when the vehicle flew for more than 200 seconds at Mach 5 off the southern California Pacific coast. For their part the Chinese have reportedly showed significant interest in HCV technology, with research and development work occurring at a number of centers, including the Qian Xuesen National Engineering Science Experiment Base in Beijing’s Huairou district. News emerged in 2007 — three years after the launch of the X-51A program — that Chinese scientists were planning to test scramjet models capable of reaching Mach 5.6 speed at a new wind tunnel in Beijing. According to Chinese media earlier this year, Chinese scientists may also have built a wind tunnel capable of testing supersonic devices at Mach 9. While the commercial applications for HCV technology are self-evident — an aircraft achieving such speeds could fly from London to New York in less than an hour — they have also caught the imagination of military scientists (the Pentagon is said to have spent about US$2 billion on six hypersonic projects in the past decade alone). One objective is to push beyond ramjet-powered cruise missiles, whose speed and range are limited by the need to keep the gas flow in the combustion unit at subsonic velocity. Being able to burn fuel when airflow within the engine is at supersonic speed would greatly enhance both the speed and range of a missile. The benefits of added range are obvious, as are those regarding speed. 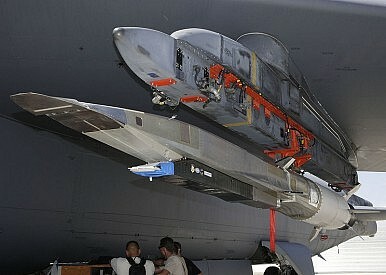 A June 2010 report by the Air Force Association on hypersonic technology points to the 80 minutes it took land-attack cruise missiles (LACM) launched from U.S. ships in the Arabian Sea to reach al-Qaeda training camps in Afghanistan in 1998 following the terrorist attacks against U.S. embassies in Kenya and Tanzania. By contrast, supercruise missiles would have “compressed the shooter-to-target loop,” meaning that the same attack would have taken 12 minutes, the report said, arguing that the 80 minutes it took for the missiles to reach their target gave al-Qaeda leader Osama bin Laden sufficient to escape. The ability to attack targets anywhere quickly is part of the Prompt Global Strike program initiated in 2001, when planners at the Pentagon began looking for the means to hit a foe almost instantly without risking nuclear escalation. Closing the shooter-to-target loop is only part of the equation, however, as hypersonic missiles would also write a new chapter in the evolutionary battle between penetration and intercept capabilities. Operating at speeds below Mach 2, current ramjet-powered missiles like Russia’s SS-N-22 “Sunburn” and the U.S.’ Harpoon, or turbojet-powered missiles such as China’s C.802 anti-ship/LACM, are slow enough that targets can intercept them. However, intercepting missiles cruising at Mach 5+ would be a formidable task and would put targets like carrier battle groups at great risk. Granted, the re-entry speed of China’s Dong Feng 21D anti-ship ballistic missile would be even greater than the maximum speed reached by a hypersonic cruise missile, but cruise missiles have the advantage of being much more maneuverable, and their low-flying ability allows them to escape notice by early-warning systems and have better chances of slipping through small tactical radar and infrared cross sections. We’re probably years from seeing the deployment of hypersonic cruise missiles, but given the clear advantages in range, speed, and precision (not to mention the benefits of having a non-nuclear strategic strike force), this is technology that has far too much appeal to be abandoned. The arms race, it seems, has entered a supersonic phase.